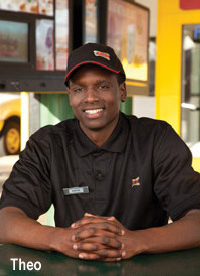 Whether you aspire to be one of our iconic Carhops or a Multi-Unit Leader, our drive-in locations are the customer-pleasing front lines of career opportunity. It’s where we directly fulfill the Bacon Cheeseburger and Chocolate Shake needs of America. And that’s a deliciously rewarding feeling. It’s fast. And it’s fun. If that’s the way you roll, then let’s go. We’re ready to feed that passionate drive of yours with a world of training, benefits and development opportunities. Buckle up – let’s take a road trip to a fun, challenging and rewarding long-term career. Like a Grilled Chicken Wrap, the SONIC Crew Member position is a savory plethora of responsibilities rolled into one. You’ll work Fountain & Frozen, Food Production, Grill, Fryer, Switchboard and, if applicable, Drive-Thru. 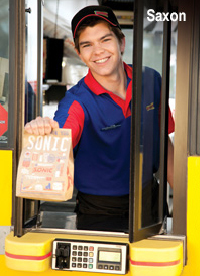 As a SONIC Carhop, you are part of an elite group, filling a role offered by no other company. It’s like being an astronaut, only the food’s better. You’re responsible for serving and delivering that food safely and efficiently, ensuring our guests have a truly out-of-this-world experience at the SONIC Drive-In.savory plethora of responsibilities rolled into one. You’ll work Fountain & Frozen, Food Production, Grill, Fryer, Switchboard and, if applicable, Drive-Thru. As a SONIC Cook, you will oversee the Appetite Satisfaction Department, which involves operating the following stations: Food Production, Grill, Fryer and other tasks if applicable. Being an Assistant Manager is the cherry on top of a Strawberry Banana Split Molten Cake Sundae. You’ll assist the drive-in’s General Manager in managing drive-in operations. You will also be involved in training and supporting other employees to ensure we provide quality food in a clean, safe and efficient manner. Responsible for leading operations, training and development of general managers, assistant managers and team members within multiple Sonic Drive-ins. 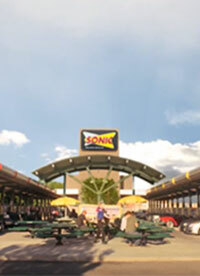 Lead drive-in managers in order to provide quality food in a clean, safe and efficient manner so that guests will have an enjoyable experience at the Sonic Drive-in.